We are a well-established organization with high goodwill in the market and produce a comprehensive range of Circular Knitting Machine. Our engineers check them at all stages to detect any flaws before they are supplied to our esteemed clients. These can also be availed in different sizes and dimensions as per the specifications laid down by the clients. 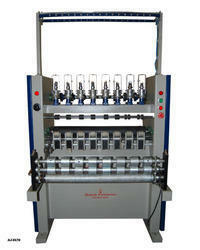 We offer Circular Knitting Machines with 8 Heads. We make use of quality materials and precision engineering techniques to manufacture these machines. Our personnel also abide by the required industrial norms and manufacture these machines that are technologically superior and durable. These machines are also offered in customized specifications to meet the specific requirements of our client's industry.